AdBrite’s vision is to offer an open and transparent ad marketplace that provides both advertisers and publishers with more control than any other ad exchange. Unlike many of its competitors, AdBrite provides full transparency to its customers – allowing them to view and manage all media properties that display their ads. 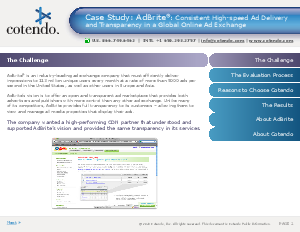 The company wanted a high-performing CDN partner that understood and supported AdBrite’s vision and provided the same transparency in its services.